Two days after NASA's rover Curiosity landed on Mars, comedian Steve Martin joked on Twitter that he was launching his own Mars mission to upstage NASA. "I sneezed on it before blast off. I hope that's okay," he wrote Aug. 8. Curiosity's cheeky response: "Oh, Steve. That's snot ok. We have rules about that." The tweet linked to a website on NASA's planetary protection rules, which aim to prevent other worlds from being contaminated by Earth microbes. The Curiosity Facebook pagealso saw its audience expand tenfold in the week after landing, to 337,000 "likes." "We hoped it would get big," McGregor told SPACE.com. Of course, "big" presents pressures of its own. 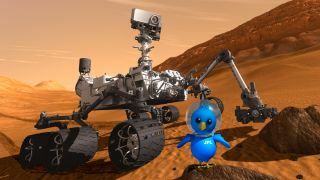 Among Curiosity's followers are a hungry pack of journalists and bloggers fighting to report news as soon as it is available. The craftier reporters also follow other accounts from the Mars rover team, such as Scott Maxwell's @marsroverdriverfeed. The challenge for NASA is balancing the demand for speedy information with its desire to have spokespeople available to speak about the results. Other employees at NASA are often privy to sensitive data before its release and will allude to results on their Twitter feeds while saving the actual news for official agency announcements. NASA has attracted criticism from some on Twitter for waiting until a press conference to release certain information. McGregor countered that it is a matter of making sure the right people are available to explain the results. Employees are urged to "use the same rules every day that you use in your personal life" when trying to determine whether NASA would want to make an official announcement about a result, McGregor added. "You don't find out your friend is going to propose to his girlfriend and then you post it on Facebook" before he actually proposes, McGregor said. "It's not your news." If an employee's field of research or instrument contributes to a significant finding, she said, it should be up to that person to assist with breaking the news — usually by lining up behind the podium at a NASA press conference. And the NASA social team works to get out information as fast as possible during press conferences, she added. The Curiosity team usually sits in the room and broadcasts the information the instant it is mentioned. One recent example was the choice to name the landing site Bradbury Landing. To aid in speed, McGregor said, at least one person on a spacecraft's social team must be authorized to tweet breaking news without higher approval. This saves the step of waiting for a supervisor to give the all-okay. In Curiosity's case, McGregor can approve her own tweets. "Because I'm right there in the middle of everything, it makes it simple to work with this team and get those tweets out," she said. NASA broadcasts some information outside of press conferences, such as uploading Curiosity's latest pictures to the mission website. Many people visit the sites several times daily, looking for uploads. In some cases, fans even have built computer scripts to scrape the new images as soon as they are available. In recognition of this, Curiosity's social team will sometimes cull the best pictures as they are uploaded and mention them on the Twitter feed and Facebook page, McGregor said. NASA has followed these social media procedures for previous missions. What makes Curiosity unique, though, is the reach and composition of its audience, which goes beyond the usual NASA fans. NASA hopes to parlay this interest into offering career advice for students and women following the mission . This usually takes place in the form of answering questions about how to work for the agency. "If we get more women who might be interested in a space mission," McGregor said,"they may also be interested in getting into a career in space."